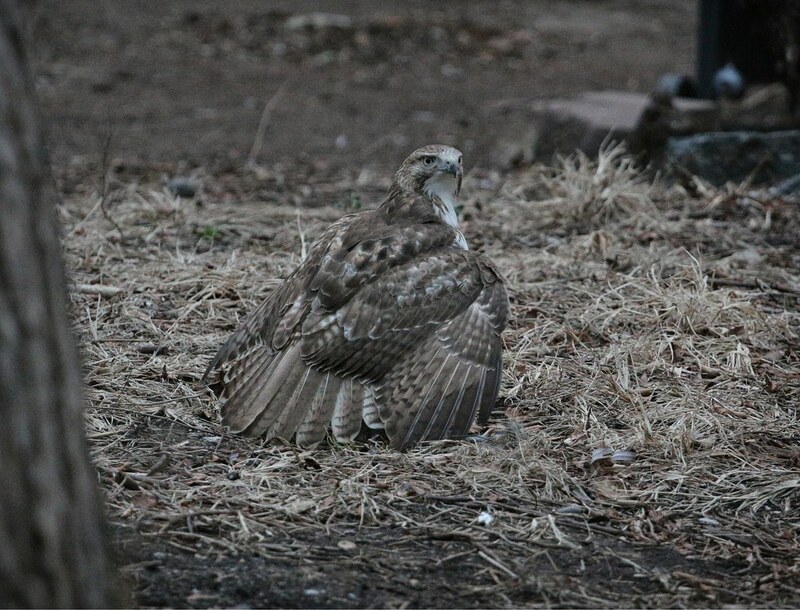 In my previous post, I described the physical differences between a couple of local juvenile red-tails. These two have an interesting relationship. Are they siblings? Migration companions? Future mates? One of them - the one I call Speckles (other people call it Bad Boy) - seems to be the dominant of the two. 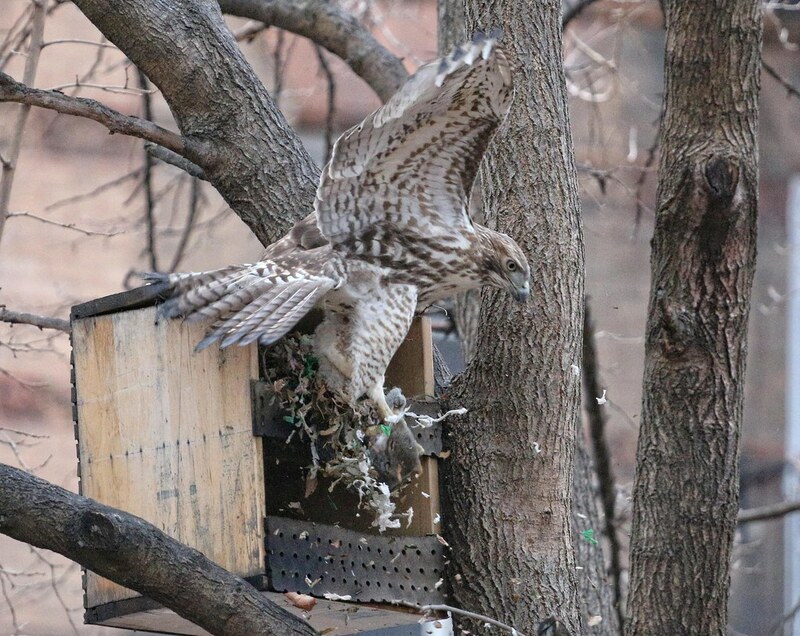 Although I've seen both hawks catch prey, they also share food, and Speckles eats first. On Saturday, I came upon White Chest, who was just finishing off a mouse. 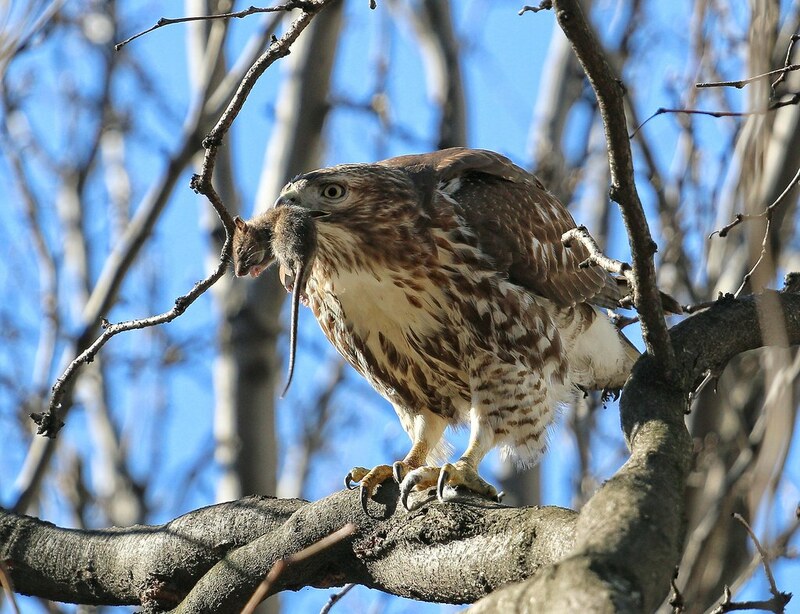 The hawk then went and caught a second mouse, which it gulped down in just a few bites. White Chest then perched in a tree to digest lunch. That's when Speckles showed up and perched in a neighboring tree. 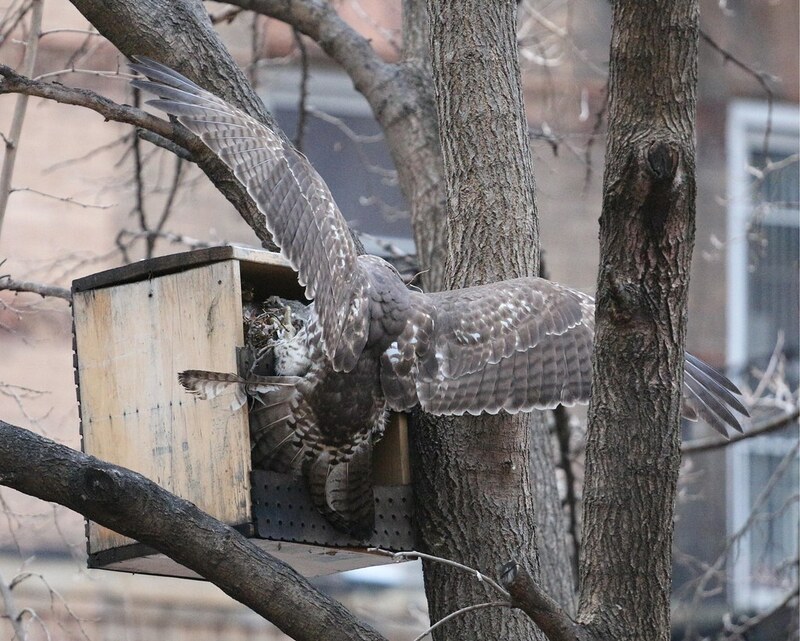 After about a minute, it dove past White Chest and landed on a box, pictured below. 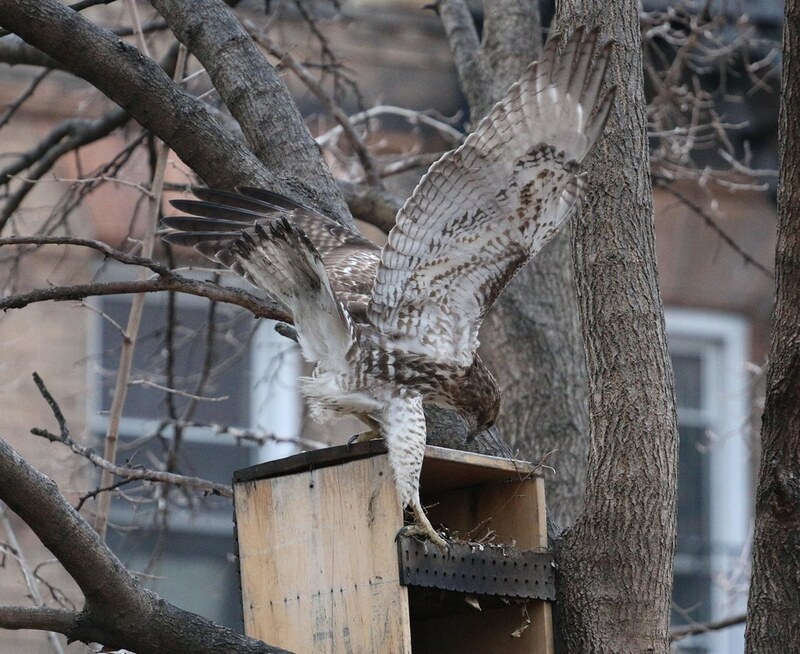 The squirrel was definitely dead when it left the box, and the hawk had moved on it so fast, I wasn't sure if the squirrel might have already been dead before the hawk grabbed it. The squirrel seemed a little stiff, which also made me wonder if it had been stashed. Speckles spent about half an hour eating half the squirrel before moving off to the side and seemingly inviting White Chest to come down and eat. 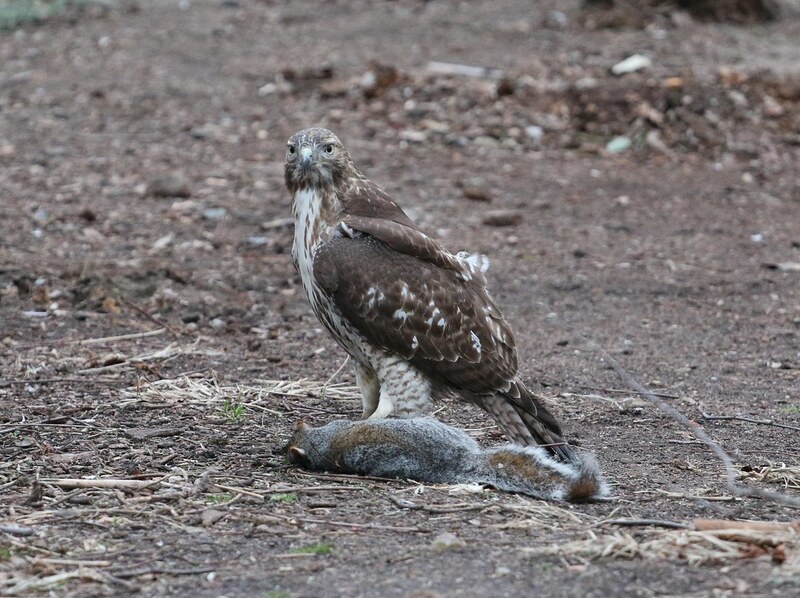 The second hawk did come down to the squirrel and mantled the meal (below) while the first hawk perched nearby making squealing sounds. I thought Speckles might lunge and push White Chest off the squirrel, but no! 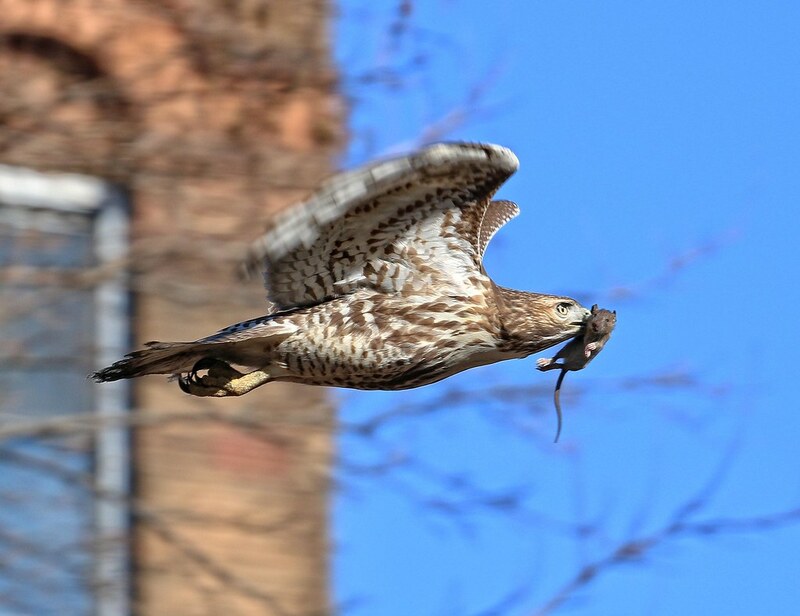 The hawk instead took off in a different direction and came up with a mouse. Dessert! 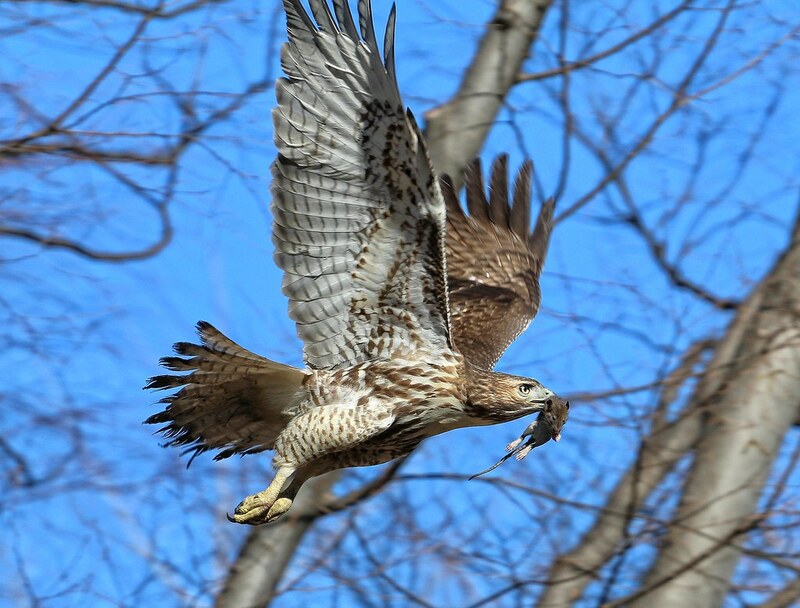 The hawk flew the mouse around a few times, then took it to a place out of my view. 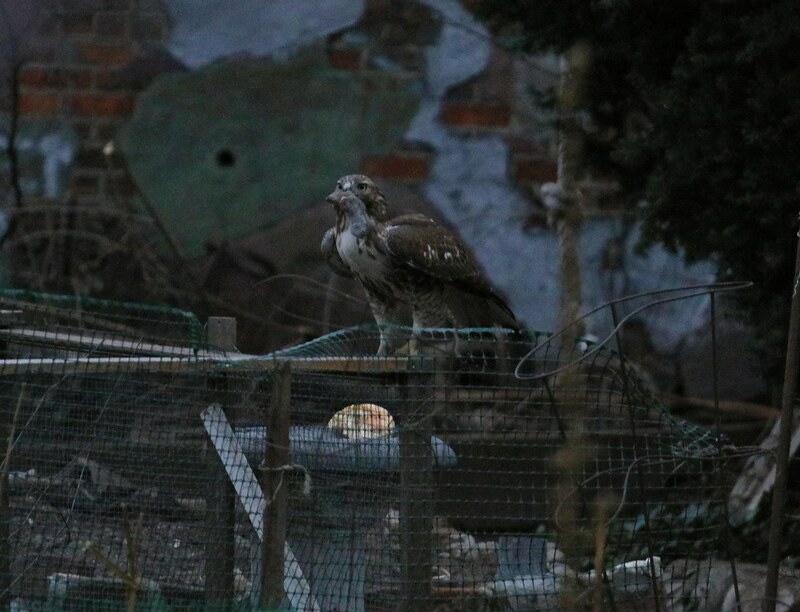 By this time, it was pretty dark, so I left the hawks to eat in peace. The following day, I found Speckles in a tree with a dead squirrel on the ground below. 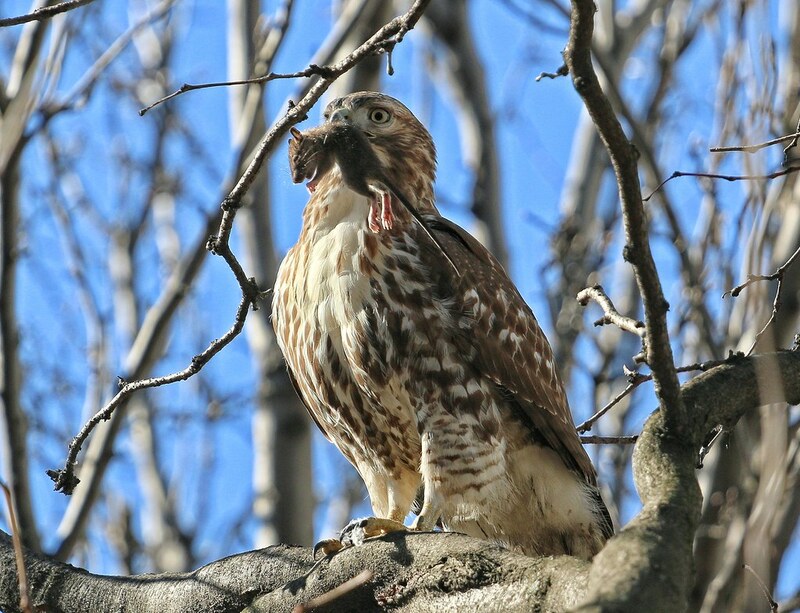 A man told me he'd seen the hawk catch the squirrel, but a cat scared the hawk off its prey, so the bird retreated to the tree. After some time, the hawk dove for a mouse that had come out into an open area. Just as the hawk reached down to grab it, the cat darted out of a bush and tried to nab the same mouse! 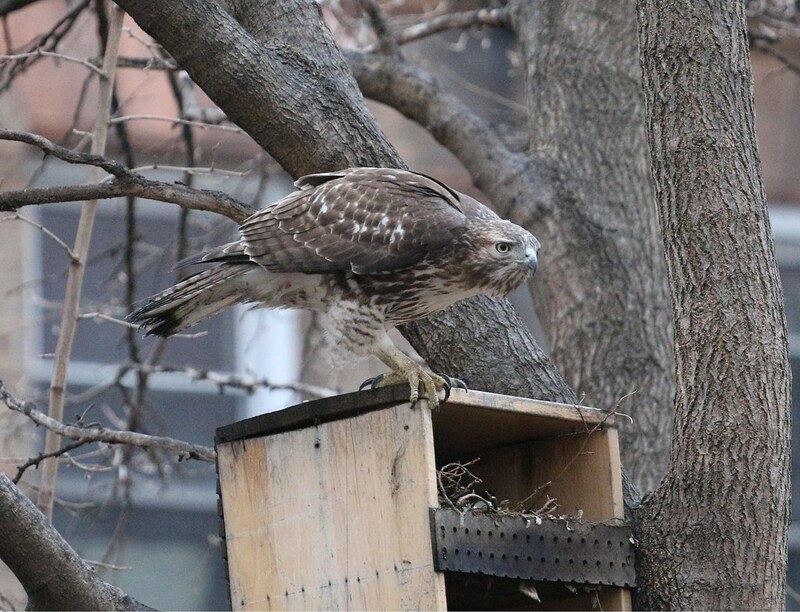 Hawk and Cat scared each other, and they took off in different directions. 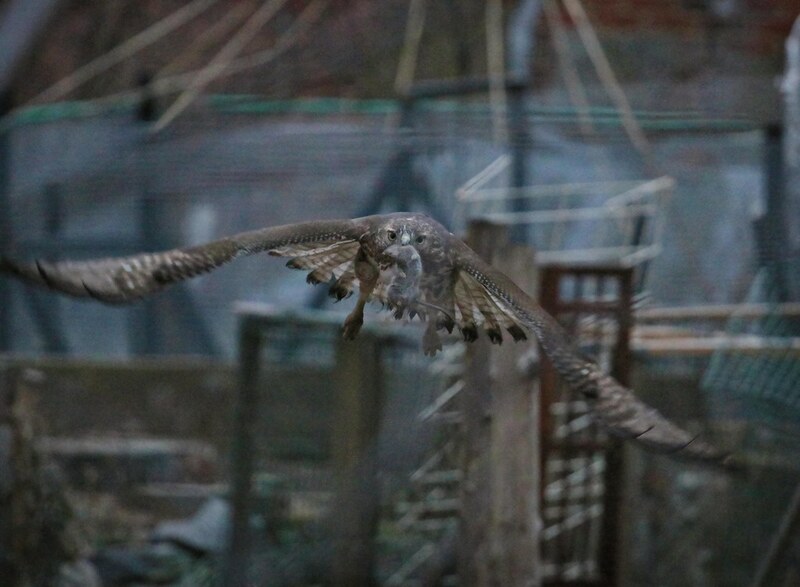 However, as soon as the cat was far enough away, the hawk swooped down and snatched the mouse. No opportunity is wasted. 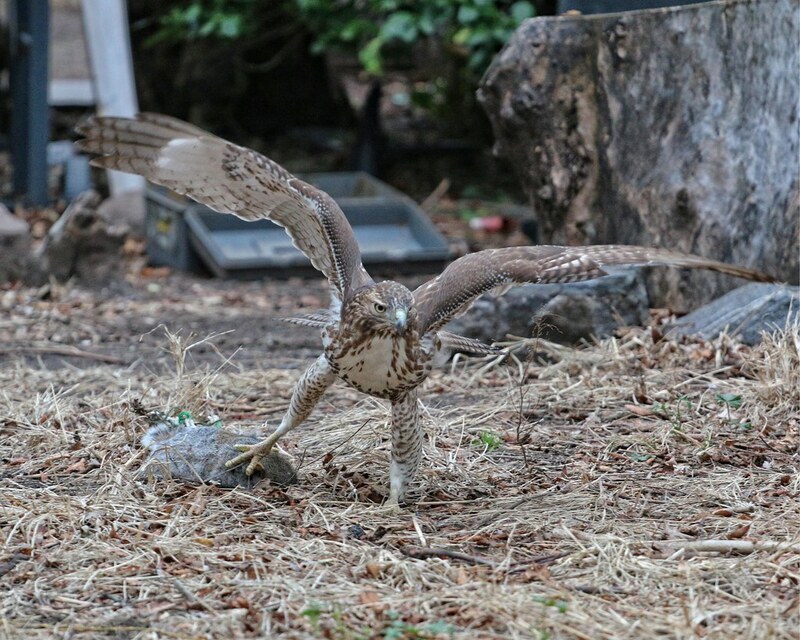 Again, the hawk flew the mouse around for a while. 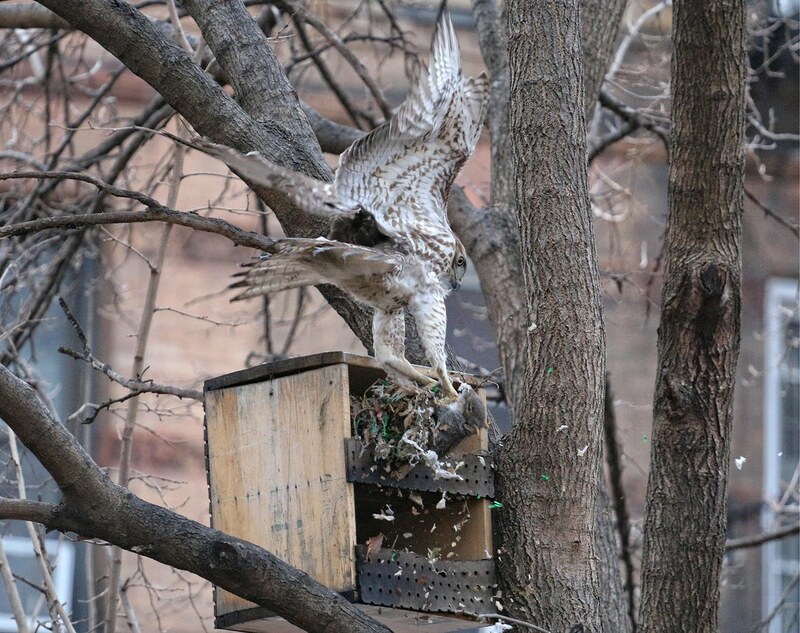 Several hours later, Speckles returned to the dead squirrel, which was still on the ground. A small crowd of people had gathered to watch. 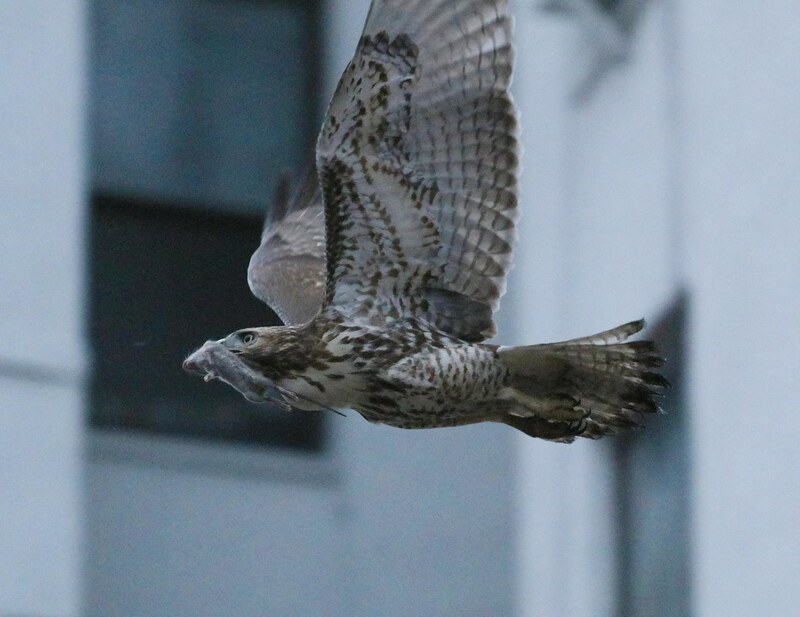 Unfortunately, someone got too close and the hawk flew up to a fire escape. The following day, I returned to the place where the dead squirrel was and it was gone, so I hope the hawk was able to retrieve it. 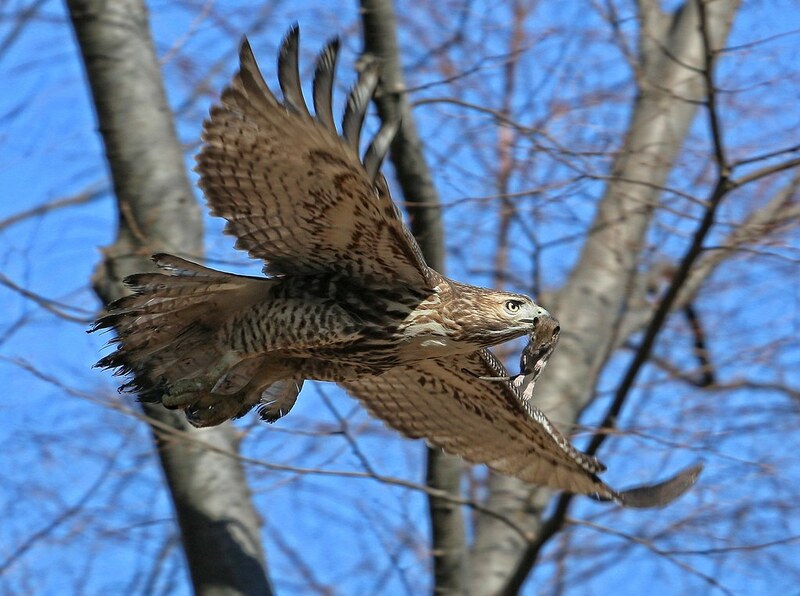 These young hawks need to learn to take their food up to a safe place to eat rather than being so vulnerable on the ground.